Celebrate that special someone with a romantic Valentine’s Dinner. Here is your guide, including a three-course food and wine dinner that personifies this special day. Preparation: Place the oil, vanilla bean pods and seeds into a small sauce pan over medium heat. Bring the oil up to a low simmer, and then remove from heat and let stand at least 1 hour to infuse the vanilla flavor. Strain the oil through a fine sieve to remove the vanilla pod (the seeds will remain in the oil). Cool completely. Combine all ingredients except the oil in a small immersion blender or food processor, pulsing until the mixture is completely blended and smooth. Slowly add the oil while blending until the mixture is completely emulsified. Transfer to a small bowl or squeeze bottle and chill before dressing salad. 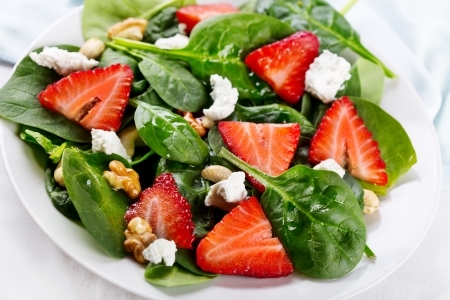 Toss the greens with the fruits and chili in a large bowl with the vinaigrette. Shave the Parmesan on top. Preparation: Heat oil in a large skillet. Add the shallot and sauté until translucent, about 3-4 minutes. Add the garlic and cook 1 minute more. Deglaze with the Albarino and add the thyme sprigs. Add the shrimp to the pan. Cook, tossing the shrimp for about 4 minutes. Add the shrimp butter and continue cooking for 4-5 more minutes. Preparation: Boil the potatoes in a large pot of salted water until fork tender, about 20-25 minutes. Drain and add butter, cream and the grated cheese. Whip until completely smooth. Slice the green beans in half lengthwise. Julienne the red bell pepper and the zucchini. Heat the butter in a skillet and sauté the veggies until tender, about 4-5 minutes. Assembly: Mound the potatoes in the center of your plate. Intertwine 2 of the jumbo shrimp on top of the potatoes. Arrange the vegetables in a circle around the outside of the potatoes. Drizzle a little of the pan juice from the shrimp over the top and garnish with a sprig of thyme. For dessert, it’s hard to go wrong with classic strawberries and chocolate. After all, you do already have some strawberries. Melt down some high quality chocolate (Ghiradelli is a good choice). Once it's melted, add a little of the heavy cream and whisk until the chocolate has a sheen to it. Drizzle over your strawberries and enjoy. Pair with Rosa di Rosa Sparkling Wine for a perfect ending to your Valentine's Day meal. Putting LED lights into old wine and liqueur bottles creates romantic lighting. STEP 1: Select colorful and beautifully shaped bottles to add variety to your display. Twist top bottles are ideal for this project. Clean bottles and remove labels. You can use a product like Label-Off found in most retail stores. STEP 2: You’ll need safety goggles and gloves for this step. 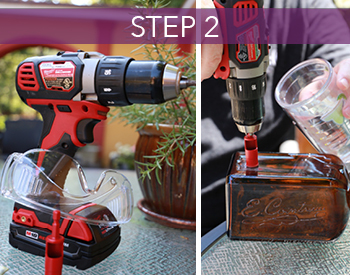 Place the bottle on a solid surface and, using a special glass-cutting drill bit, apply light pressure slowly to the bottom of the bottle to create a hole. Have some water nearby in case the glass gets too heated. Repeat this process for each bottle. STEP 3: Insert LED lights (two sets for each bottle) into the hole, working your way up to the neck of the bottle. 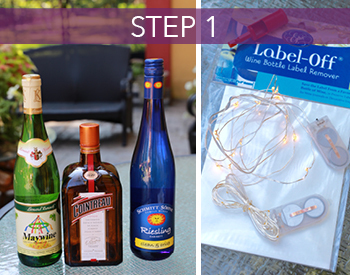 You’ll have plenty of excess wire on both ends of the bottle that you can push inside to ensure a sprinkling of lights throughout. Be sure to leave the on-switch of the LED lights out at the bottom so you can access them. You can purchase these inexpensive light kits from an online source like Amazon. STEP 4: Twist cap back on the bottle. Turn on the lights and enjoy your display. No need for an elaborate or expensive centerpiece. Simply tie flowers (as we did here), ribbons or greenery around the neck of a bottle of champagne or wine. Secure with floral wire if necessary. You’ve got the meal planned, the flowers are on the table and the lighting dim and romantic. Now, make the mood just right with a playlist. There are tons of options available for this—streaming from online selections, putting together songs from your own library, or going old school with CDs or vinyl. Let romance be your guide! Show you care with a custom-made Valentine’s Day gift basket. Might we suggest a Champagne Gift Set, Wine & Chocolate Basket or a basket with his/her favorite beer, wine or spirits? Want a Romantic Cocktail for the evening? Click here for recipe ideas.